The contradiction of man: always complaining about time passing so fast, but on the other hand, we don´t like testing our patience in any way. When someone asks us to wait a few days or a few weeks, we despair. What happened to the old pleasure of containment and waiting? We demand immediate results with minimal effort. But life marks its own pace. Everything involves a process and requires work: the seed becomes a tree, the stomach takes few minutes to warn the brain that it’s full, there are four seasons and to reach the summer we have to spend the winter, the diseases and the recoveries take time on showing up. As well as love, friendship and happiness must be earned every day. So we should copy life and not vice versa, as the planes copied birds or boats fishes. Nothing is immediate or aimless, even though we don’t notice it. But certainly there are so many things that we do not realize, as the rotation of Earth under our feet, that sometimes I close my eyes and think nothing outside really exists. All is a set that someone put on. The white clouds on the sky, the snow falling like cottons or the mechanic move of the sea. We don’t perceive the reality, only what our senses transmit to us. For example, the colors are the result of an optical illusion. There is only black –absence of light– and white –light–. That makes me suspect that life is a kind of a test. 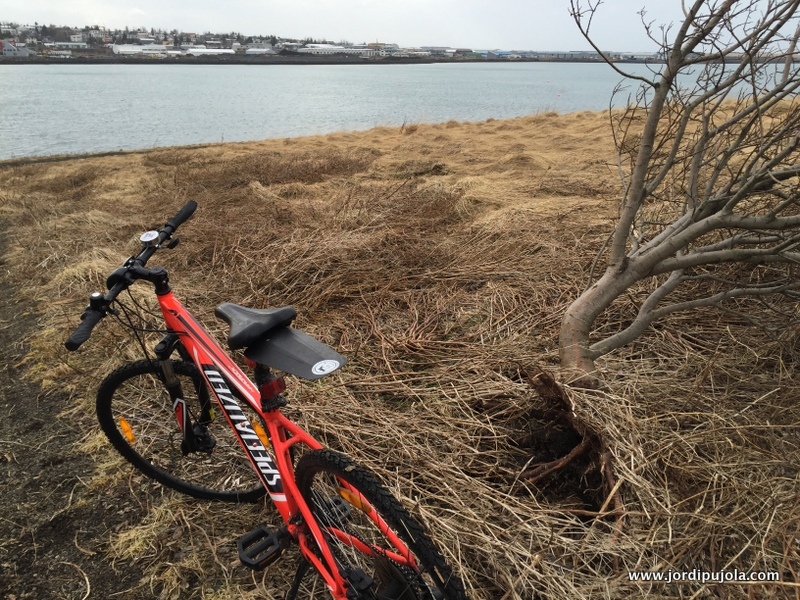 Life is like riding a bicycle in Reykjavik: before starting we have to plan the route, watch the sky, decide what clothes we are going to put on and pedaling. The easiest way is to get into a car, turn on the air conditioner or heater, turn on the radio and push the gas. Then we don’t notice the smell of the freshly cut grass, whether the wind is against or in favor (in Iceland almost always against) or the street goes up or down. In that regard, cycling is like training for the unavoidable problems of life. Biking Reykjavik is like dealing with life. Our lives are a kind of test that we can´t avoid. By the way, particularly in Iceland when riding the valley of Fossvogur (Reykjavik), listening to the birdsong from the trees a on the wet, feasting on worms and seeds, is a privilege. I spread their joy. Birds don’t fear bikes because they don’t consider them an enemy. This “summer” wild geese have been breeding. In the morning, the families walk in a row without breaking it even when getting into the lake; the baby birds have not developed the plumage yet. At night they shelter under their mother’s wings and the father becomes unusually aggressive against the minimal external threat. Is this not an invitation to merge with nature? In Iceland, as the weather, the colors change constantly, especially reflected on the sea. It’s not the same before the storm, dark blue, that when the sun rises and becomes greenish; or when it is raining or snowing. Sometimes the wind is so strong that when going down on a slope you feel the bike going back in reverse. At those moments, with the hail hitting my face, frozen fingertips and still several kilometers ahead, I wonder: “What the hell am I doing here“. In extreme conditions the same route would require to invest triple time; each pedal stroke is like a trace in a rock. But this gives you time to think and reconsider the importance of things that really matter. I know eventually that I will reach my destination. Besides that, it’s an excellent exercise for the mind, the spirit and the body. Another reason is freedom. Nothing like biking Reykjavik when the sun rises after a good snowfall and see the shiny black crows hover Reykjavik. Iceland is the country where the sun is always a caress, unlike in Spain where having a meal under the sun in summer is only for tourists wearing sandals with socks. Jordi Pujolà, Spanish writer in Iceland. One Response to "Biking is like life in Reykjavik"